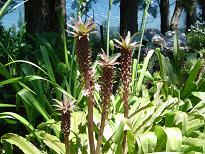 The Eucomis, the Agapanthus campanulatus, A.inapertus and A. inapertus subsp. intermedius ‘Wolkberg’, one of the new hybrids ‘Blue Velvet’ as well as A.coddii, the Selago corymbosa, the Galtonia candicans, the Gloriosa superba, the Crocosmia aurea and C.paniculata. These are all able to be cut for the vase. I must confess I get quite confused with all the different Agapanthus varieties that are around, to know which is which one really needs to be an expert. No matter what variety they happen to be, they are all wonderful both in the garden and in the vase.